If you’ve ever had dozens of unexpected guests turn up on the day of an event, or found yourself setting up multiple event registration options for adults, kids, VIPs and early bird tickets, our recently released event enhancements are here to help. In response to your feedback in the Wishlist Forum, in version 6.4 Wild Apricot added two enhancements to the Events module: setting limits on guest registrations and duplicating registration types. Set a limit on the number of guests that each registrant can bring. You can set this to be different for each event and each registration type. Duplicate an existing registration type. This makes it easy to set up similar registration types without having to enter all the information again, and you can still edit the copy as much as you need to. 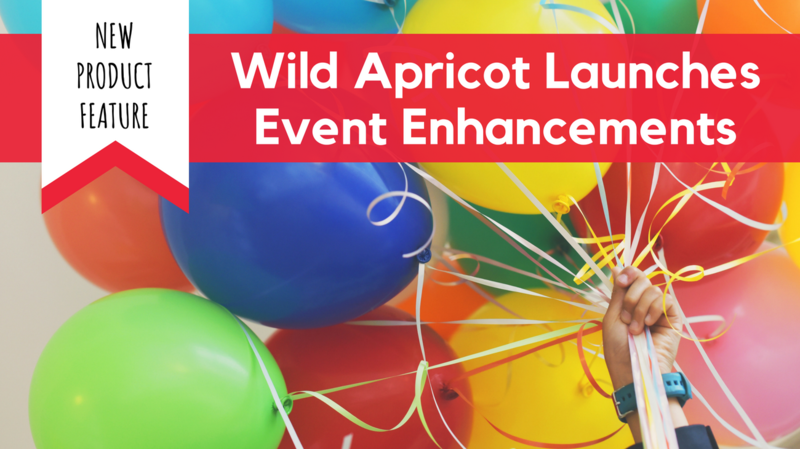 In the Wild Apricot Events module, you can control how people see and register for your events. You can customize your registration form to collect information about attendees, to provide additional event options at a separate cost, or to restrict the availability of the event so that only people from selected membership levels can register. 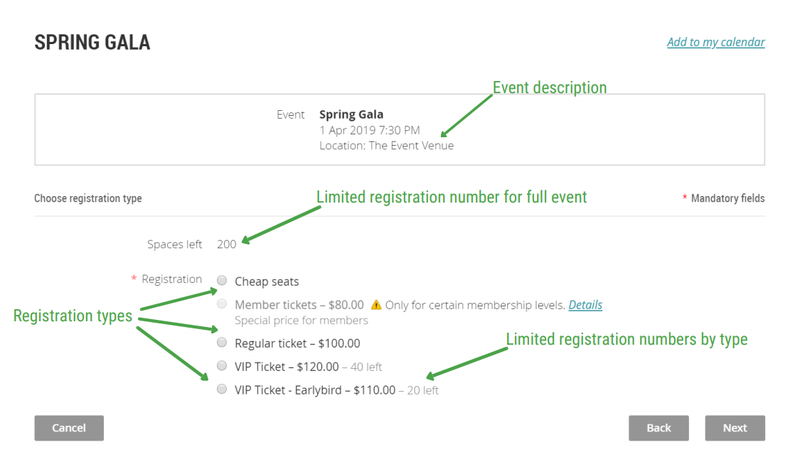 Registration types are like ticket types for a particular event. Setting up registration types allows you to charge different prices for different event packages or for different kinds of attendees. For example, you might want to charge more for non-members, or for special seating. Before we look at the new event enhancements specifically, let’s recap how to manage registration types and where to find these new features. 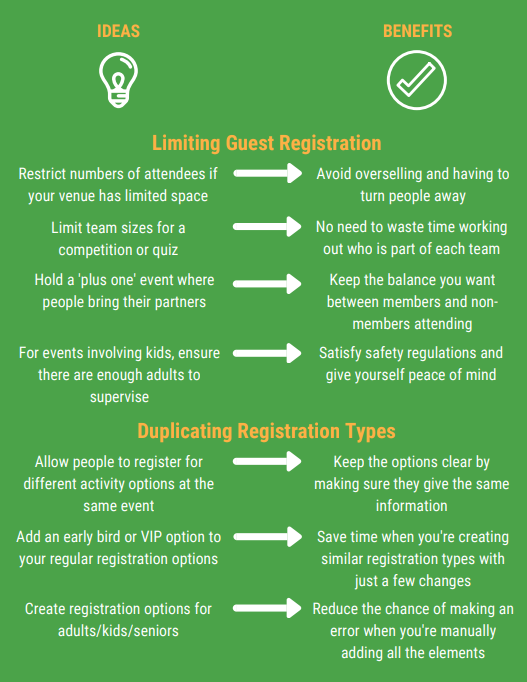 If you’re already comfortable with editing registrations, you can skip ahead to the sections on duplicating registration types and limiting guest registrations. Select the event you want to manage from the list. Click the Add type button under the Registration types heading. If this button is grayed out, that’s because you’re currently editing other registration details. It isn’t possible to modify registration types while you’re already in edit mode, so click the Save or Cancel button and the Registration types & settings tab will reload. Fill in the form with all the information you want to add to your registration type. If the registration types are shown in gray and you are unable to select one, you will need to exit edit mode first. Click the Save button to save your changes or click the Cancel button to discard them, and the Registration types & settings tab will reload. Click the Duplicate button. The new duplicate registration type is automatically loaded. The word ‘copy’ will be added to the name of the new registration type to distinguish it from the original one. In the Registration types & settings tab, you can set a limit for the total number of people who can register for the event, or a separate limit for each registration type. Enter the limit in the Event registration limit field. Go to the Registration type & settings tab. Select the registration type you want to edit. Go to the Guest registration section. Next to the Guest limit heading, you can enter in the maximum number of guest tickets available to each registrant. What happens if someone tries to register more than the limit of guests? If a person is registering for your event and has already added the maximum number of guests, they will be shown a notification telling them that this is the case, as in the screenshot below. They will be unable to click the Add guest button, and it will be grayed out to show that this option is not available. Can you add a limit once the event has been published on your website? Yes, just follow the instructions for ‘Limiting guest registrations’ and this will be updated on the website. This won’t affect any existing registrations. Can you use duplicated registration types and add them to other events? The duplicate function for registration types can only add a copy to the event that the original registration type is for. However, if you’re creating several events that will have similar or identical registration types, you can duplicate a whole event. This will include all the registration types and preferences, but still allow you to edit the event details. To make a copy of an event, select an event from the Event list, and click the Duplicate button on the right. Make any necessary changes, and click Save. For more detailed instructions on how to use these features, and for information on the complete range of features in the Events module, visit our Help Site pages on event registration types and guest registration. If you have any questions, or need help setting up an event, feel free to contact our support team.